The 1919-21 W514 baseball card set consists of 120 cards that measure 1-3/8" by 2½". The W514 baseball strip cards were sold in long strips and then cut out by the store owner or consumer. The W514 set is one of the earliest strip card sets, the largest of these sets and is one of the most commonly collected strip card sets. 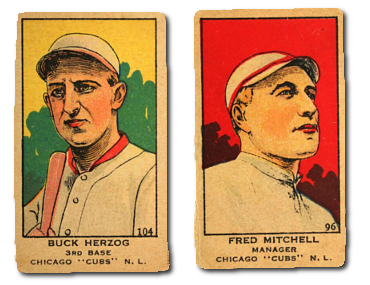 The W514 cards have a colorful front featuring painted portraits of the players. The card numbers are included within the border on the front of the card, and the player name, position and team sit below the image. Card backs for this set are blank. Some of the notable players and key Hall-of-Famers included in this issue are the: W514 #2 Babe Ruth, #15 Shoeless Joe Jackson, #43 Ty Cobb, #56 Rogers Hornsby, #72 Christy Mathewson, #91 Buck Weaver, #94 Walter Johnson and #113 Casey Stengel. CLICK HERE if you want to sell your 1919-21 W514 Baseball Cards.